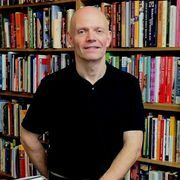 Matt Sartwell is the Managing Partner of Kitchen Arts & Letters, an NYC bookstore specializing in food and drink. He’s the store generalist, doing a lot of weeknight cooking, occasional sweet and savory baking, preserving, and dabbling everywhere. (Cookbooks are to him as shiny things to a magpie.) A former editor at Penguin, he has also been chair of the James Beard Foundation's Book Awards. 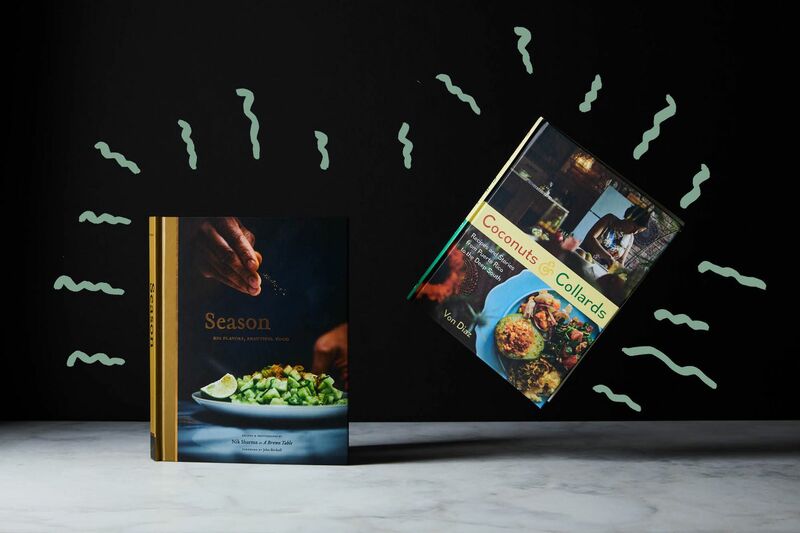 Why do people buy cookbooks in this day and age? Recipes are easy-peasy to find online. Google promises more than 125,000,000 chocolate chip cookie recipes alone, and already more than 150,000,000 recipes geared towards Instant Pots. So why pay for a cookbook? Since I sell cookbooks, among other books on food and drink, I’ve given this some thought. I’m convinced that what people pay for is a point of view, a perspective. Sometimes they want expertise that comes from passion, as they get from Stella Parks’ Bravetart. And sometimes they want a journey, a story of the sort found in 2017’s Piglet winner, My Two Souths by Asha Gomez. Many wonderful books offer a mix of these qualities, and I found them in abundance in both Coconuts & Collards by Von Diaz and Season by Nik Sharma. Each is written by a cook who has found herself or himself a stranger in a strange land. For these cooks, food and cooking are a means to maintaining a connection to the past while defining a new identity. If that sounds a little too earnest for you, don’t be put off. There is some very good food here. I began by making a couple of pantry basics that Diaz points out are used extensively in Puerto Rico. The Sofrito is a puree of garlic, peppers, mild chiles, onions, and herbs. Raw, it is fairly harsh, but everywhere Diaz called for its use, it was cooked. Sazón is a spice mix that many cooks buy pre-packaged, but Diaz makes her own and I thought I should follow her lead. I wasn’t wild about it, simply because I think different dishes need different proportions of ingredients, but it was a starting place at least. Then I tackled Picadillo, a hearty meat stew that I have eaten in restaurants and other people’s homes, but never made for myself. Diaz says she could always find picadillo in her grandmother’s refrigerator. “As a kid, I would sneak into the kitchen at night when I couldn’t sleep and eat it out of a container with a spoon.” That says “comfort food” to me. The sofrito gave off appetizing aromas as I began cooking it, and the whole dish—which includes tomato sauce, sazón, pimento-stuffed olives, capers, optional raisins, and a very modest amount of salt and pepper—was ready in about half an hour. I liked the contrast between the rich, fatty meat sauce (we aren’t instructed to drain the fat, which is fine with me!) and the sharper olives, capers, and raisins. But I wanted more contrast. And more flavor. I’d followed the instructions to add salt and pepper as needed, but they had their limits. Only once I granted myself the liberty of a generous amount of vinegary hot sauce did I find all the flavors pop. I hesitated at this step, though. Diaz notes in the book how often she has been confronted with the expectation that Puerto Rican food is hot—potentially too hot. And that is simply not its default mode. But it wasn’t the heat I wanted, so much as the acidity that a mild hot sauce offers. After a bit of hot sauce, I then added more olives, too, and felt like I had something I’d really enjoy. I may have been a long way from Tata’s picadillo by this point, but when I Iater consulted other Puerto Rican cookbooks, it seemed that nearly every recipe varied widely in proportions of ingredients. Some had much more tomato; some included potato and coarsely chopped peppers in addition to sofrito. Clearly, it was a dish with nearly as many versions as there are grandmothers. Maybe I was still somewhere on the picadillo spectrum. Opposite her picadillo recipe, Diaz offers a recipe for Sanguiches de Picadillo, which is essentially a grilled American cheese sandwich with picadillo inside. These sandwiches are a totally worthwhile use of picadillo, and I want to know why I have never encountered them before. The extra olives and some hot sauce played a great role here as well. People who love cookbooks often say something along these lines: “If I can find just one recipe I like in a cookbook, then the book is worth having.” I found that recipe in Asopao de Pollo, a dish that Diaz says is inspired by her mother—a hardworking woman who was often forced to be thrifty. The dish is a chicken and rice soup, with a little tomato, some sofrito and fresh herbs, chicken breasts, (theoretically optional) peas, capers, more olives, and sliced avocado. On my first attempt I learned that sofrito can burn pretty fast, so I started over, favoring the "medium" part of the medium-high heat I was supposed to be using to cook it. Once I had focused my attention better, the soup came together quickly. After adding the rice and chicken stock along with other seasonings, I needed to wait just ten minutes before adding cubes of chicken breast and giving them a little more time to cook. In went the optional ingredients, and suddenly I had a wonderful soup that needed absolutely no seasoning adjustments. The rice had given the soup a comforting body; the herbal notes made me think of spring; and the chicken was tender and had absorbed just enough seasoning to taste like it was part of the soup, but still chickeny. And I knew that the next time I stopped in the grocery store on the way home, without having planned what to make for dinner, I could remember this soup and have it on the table not long after. That’s the kind of recipe I enjoy, one that makes me recommend a book eagerly. Finally, I turned my hand to a Bizcocho de Ron, or rum cake. This is another childhood favorite of Diaz’s, something her mother was famous for. Her mom’s version relies on a cake mix, but Diaz had worked up a from-scratch version of her own. It still uses a box of vanilla pudding mix, which gave me some sentimental flashbacks to the 1970s, but the fact that this cake was so popular among Diaz’s friends caught my eye. The cake is baked in a bundt pan and sprinkled with a generous amount of chopped walnuts. I began by lathering my bundt pan with cooking spray, as the recipe calls for. I rarely use cooking spray and I was a little concerned that I had overdone it. But how to be sure without baking? Onward! Instead of the familiar first step of creaming of butter and sugar, Diaz first combines all her dry ingredients with a stick of butter cut into small pieces, using a stand mixer to blend them. The recipe didn’t specify whether the butter should be cold or room temperature, so I winged it by waiting ten minutes after I had taken it out of the refrigerator. The mixer rapidly broke the butter into tiny pieces, which were immediately coated with the flour-instant pudding mixture. I figured I had made a good choice. Into this I poured milk, eggs, and coconut oil, and after some mixing, added vanilla and rum. The resulting batter was thick but pourable. As I leveled the batter in the pan, I felt obliged to sample it, warnings against consuming uncooked eggs be damned. It was rummy, and that was definitely a point in its favor. I checked again to make sure. Still rummy. A good sign. Diaz’s instructions told me to bake for 50 to 60 minutes. Conditioned by years of cheap N.Y.C. landlord stoves, I checked the cake at 45 minutes and it was clear that it would be ready soon. I pulled it out right at the 50-minute mark, and it passed the clean-skewer test. While the cake sat in its pan on a cooling rack, I prepared a buttery rum syrup that took about ten minutes. Wielding the same skewer as before, I poked holes throughout the cake and then poured the syrup all over it. At this point, the recipe instructed me to “cover the pan with aluminum foil and allow to soak for at least 3 hours or overnight.” Since it was now nearly bedtime, I chose the latter option. Actually, it wasn’t until dinnertime the next day that I attempted to unmold and serve the cake. And it was not cooperative. I ran the blade of a knife around the complicated edge of the pan, but it didn’t budge. Then I gave the pan a few pretty serious whacks on the counter, plied my knife a little more, and at last, most of the cake emerged in one piece. Another whack dislodged the remaining piece and, happily, it cohered enough that I could drop it into place, and few people would have been the wiser. It was a very moist, delicately flavored cake. The crunch and faint astringency of the walnuts is a smart touch, and the paths of the rum syrup through the cake were apparent to the eye and very noticeable on the tongue. At first I wished I’d had more syrup, but then I realized that the difference between the zones was important. My True Love was earnestly enthusiastic in his praise, and so too was the friend to whom I delivered part of the cake the next day. And isn’t this a big part of why we bake? To share some happiness? Nik Sharma grew up in Bombay, India, and he still thinks of it that way—even though it is now Mumbai. His mother’s family is Roman Catholic, from the Portuguese-influenced city of Goa, and his father’s family Hindus from Uttar Pradesh, in the north. To this remarkable blend of influences, a scholarship in molecular genetics brought Sharma to to the U.S.. This is where he came out, married a man from an Appalachian farming family, and began cooking with a passion fed by his new world of food. Now living in the San Francisco Bay Area, he has further expanded his exposure to different cuisines, although Indian flavors predominate. I started testing with Sharma’s Chouriço Potato Salad, which first required making Goan-style chouriço, a fresh pork sausage the incorporates distinctive coconut vinegar, fresh ginger, Kashmiri chiles, and a range of other herbs and spices. Sharma suggests substituting apple cider vinegar if you can’t find coconut vinegar, but given what the coconut vinegar contributes in terms of flavor and aroma, I would seek it out again. I also decided to make, rather than buy, the Paneer that Sharma called for. Paneer is a fresh milk cheese common in northern Indian cooking, and as Sharma notes, it doesn’t melt. It requires only milk and an acid, for which I chose lemon juice. Bringing a gallon of milk to a boil takes some time over medium heat. And I am here to tell you that it’s definitely worth stirring relentlessly as it comes to a boil. Even though the milk did not scorch or scald, I ended up with browned milk fat on the bottom of my Dutch oven that took some serious elbow grease to remove later. Additionally, a word to the wise that the curdling process happens quickly once you have added the acid. Sharma warns cooks to have some extra acid on hand in case the curdling isn’t quite complete; my batch needed more acid, and I probably overdid the "more," since my eventual paneer, while tasty, was just about the firmest fresh cheese I have ever eaten. One of the distinctive things about Sharma’s potato salad is that he doesn’t boil the fingerling potatoes. Instead, he halves them lengthwise, and cooks them in olive oil in a skillet. The recipe suggests they will become tender in 5 to 6 minutes this way. Mine took much longer—closer to 15 minutes—during which the cut sides acquired a nice brown hue. Once I added some of the crumbled chouriço to the pan with the potatoes, the aromas from the previous night’s sausage-making returned with gusto. The meat browned quickly. I tossed in some pumpkin seeds, gave them a minute to toast, and then transferred everything from the skillet to a bowl. With some added chives, cilantro, and lime juice, along with the paneer, dinner was ready. The Cocoa-Spiced Bean and Lentil Soup seems intended to be a weeknight dish (overnight bean-soaking prep aside). Sharma says it’s his way of using up pantry odds and ends—specifically, the different beans and lentils he finds in his cupboard. I probably took this too much to heart, not even stopping to think about the possible age of the lentils I had on hand. My first attempt at the soup was a failure, simply because the lentils I used never became tender, even after three hours of cooking. It was during this time that my True Love and I realized that the lentils had to be at least a year older than the Trump administration. Mea culpa. On the second take, fresh lentils to hand, I was pleased. The smells of cocoa, sautéed diced onion, and garlic dominated. Sharma called for other spices as well, including mace, which I don’t think I have ever used in a savory dish. It was only half a teaspoon and in the end I am not sure that I could detect it against Kashmiri chile, coriander, and the cocoa powder. After adding the beans, lentils, and water to the aromatics, and simmering for an hour, the soup was ready—and this time, everything was tender. I ladled it into bowls, added a dollop of thick Greek yogurt to each, and garnished with some fresh mint leaves. After the vigor of the potato salad, the soup was less distinctive. The yogurt, like sour cream in chili, was a welcome touch, even though the soup was not as spicy. I’d been hoping for some kind of flavor alchemy, as with the potato salad and chouriço, but it just hadn’t happened. Throwing caution and budgetary restraint to the winds, I decided to try my luck once more, this time with Spicy Chocolate-Chip Hazelnut Cookies. The financial extravagance lay in purchasing hazelnut flour, a small bag of which set me back nearly $20 at my local grocery—for a recipe that makes a dozen cookies. The hazelnuts are the only flour used in this recipe, which are sweetened with jaggery (a mostly unrefined sugar that Sharma calls his favorite, for its “salty and earthy notes”) and studded with chopped chocolate and crystalized ginger. An egg and only a couple of tablespoons of butter, and some vanilla, sea salt, and black pepper complete the recipe. Mixed with a wooden spoon, the dough comes together quickly. It doesn’t become as homogenous as, say, a Toll House cookie dough, and has a tendency to crumble. I had to work the dough with my hands to gently shape it into balls, flatten it on a parchment-lined baking sheet, and freeze the dough rounds for a couple of hours. Sharma instructs to bake the cookies until they are golden brown, but since the dough was rather dark to begin with, I'm glad I baked in small batches. That way, I could refer to the unbaked dough and evaluate the proper color-change. I enjoyed working with each of these books. I don’t fault either of them for the fact that I had to take some initiative with seasoning, or make other decisions for myself—that’s the way I generally cook. When I occasionally compare an actual recipe I read long ago with my own adapted version of it, the differences can make me laugh. I suspect that’s what will happen with Diaz’s asopao de pollo; in a few years, I’ll still be crediting her for it in my head, even though she might not recognize the dish were I to put my version in front of her. Ultimately, though, I found that Sharma’s Season was the more eye-opening book for me. When I first made my list of possible recipes to test, it offered many more temptations, and my results in cooking from it gave me ideas that I wanted to try with other things.While Coconuts & Collards is a book that grounds and reaffirms, Season is a book that excites and inspires me, as few books have in recent years. I’m delighted to see a first-time author whose work is this confident and adventurous, and am eager to find out what comes next from him. Thank you for a very thorough and fair review of two good cookbooks. I am cooking from Coconuts and Collards for a Piglet dinner. The recipes I picked and have made are the same ones tried here. And they really are delicious. And yet, I actually picked Season to win this round. Definitely one I look forward to cooking from. Great job. Love this review! The comparison to other books' recipes and the way he describes the experience of cooking things like this regularly at home mirrors how I use cookbooks. Very helpful! I loved the writing. I have the Seasons book and will have fun trying the recipes. I'd say blogs have a ton of perspective too, or there wouldn't be ongoing complaints of "I'm sick of scrolling for the recipe." I still use cookbooks because they are r&d'd. I have a near-zero success rate for every recipe I try from random indie blogs that get themselves highly ranked on Google. Every time I break my 'only sites from teams and test kitchens (here, SE, etc)' rule because I love the look or sound of something, I regret it. So delightfully written! Picadillo Sandwiches is going to be happening at my home this weekend for sure. What a thoughtful and thorough review! Very thorough review of each book. Having recently visited Puerto Rico, I was interested to learn if I should add that book to my collection. Matt’s experience cooking from it makes me think I need to search for a more authenticity Puerto Rican cookbook. I already own Seasons and I’m not at all surprised that Matt chose it to advance to the next round. I purchased the book, but have not yet made anything out of it. However, if Millie's taste/recipes are any gauge, then the cookbook should be a great one. Additionally, it is well rated on Amazon. Supposedly, it is a bit dated format-wise, but authentic gems are abound. The cookbook is written by the author of Cocina Criolla, which is apparently the Puerto Rican Joy of Cooking. Melissa Clark did a neat interview around Cocina Criolla and the Puerto Rican home cooks that use it. So nice of you to share all this Heather! Thank you so much! While reading this I thought the winner was going to be Coconuts and Collards. Review was thorough and a good read. There has been a lot of press around Seasons and I am concerned about ingredient sourcing. I would appreciate community comments. I haven’t had many problems with ingredient sourcing. Obviously a few smart swaps are needed, i.e. brown sugar instead of jaggery.... or making an amazon order for hazelnut flour! But generally it’s a winner of a cookbook and I’ve been thrilled with the ten or so recipes I have made. I'm actually surprised that that didn't come up yet. 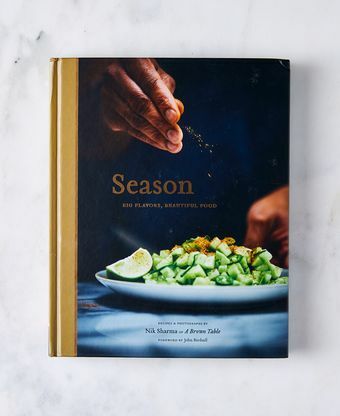 I own Season and I think it's a gorgeous book, but nearly every recipe has an ingredient that I either never heard of or that is hard to source. And the author almost never gives you a substitute that you could use. In reference to the magical hazelnut cookies, I've also had great success with more affordable/available substitutions - using brown sugar instead of jaggery helps make the cookies less crumbly in my opinion, and I've often made them with 50% hazelnut/50% almond flour or 100% almond flour with almond extract. I've enjoyed the modified cookies every bit as much as the original recipe, though the results are distinct. Zero complaints from the reader for this review! It's well-written and proposes valid analyses of each book. Ultimately, it was a great read for my trip home from the airport late at night. It'd be an equally great read at other times of day, also. Well done, Matt! Hi Laura, pardon our flub—swapped out the poll for the correct one. Thanks for mentioning!